With the FastATA 4000 controller you can now take advantage of the latest low-cost, high-capacity ATA/EIDE devices like hard drives, CD-ROM drives, CD-RW drives, ZIP drives, LS-120 drives, etc. The recommended configuration is: Amiga 3000/4000 with 68060 (or PPC with 68060) processor card with 64MB RAM. The FastATA 4000 controller with its maximum transfer rate of 16.6MB/s in the PIO 4 mode offers huge capacity reserve for fast mass storage devices, especially for fast hard drives. Therefore, applications may run much faster if they can have fast access to large data files. The FastATA 4000 controller implements the ATAPI standard as well, for use with devices like CD-ROM, CD-R, CD-RW, ZIP, LS-120, DVD drives. This enables connection of ATAPI-standard devices to the Amiga with no need of installing additional software. Limitations on support for >4GB HDDs have been eliminated in the FastATA 4000 controller. The FastATA 4000 controller may be used with >4GB HDDs independently of the installed filesystem. 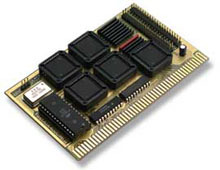 The FastATA 4000 controller automatically detects type of processor and optimises and modifies some software routines in order to achieve the highest possible data transfer rate between the controller and the computer memory. The computer recognises the controller as a 32-bit device configured in the Zorro-III space. Full 32-bit operation of the controller combined with very efficient software guarantee significant increase in the speed of your computer. The FastATA 4000 controller fits any selected Zorro-III slot.